Apart from the fact that the Democrat Party is in a shambles, and they’ll never admit it, Democrats PAC’s are not necessarily so and are now going all out in funding state and local races, an area dominated by Republicans in recent years, and starting to win some. That is bad for Americanism and the Republican party and good for Socialism. One lesson we should take away from the Virginia governor’s race is that the Democrats will apply lessons learned to all upcoming state races, while the GOP reads polls. It is clear that the Democrat PAC’s have gone after and energized their base. The scale of their effort even reached into many less reported, smaller state and local races in Red States and are bearing fruit. They are organized and the GOP still haven’t passed a meaningful bill (health care or Tax reform). I’m afraid the Establishment Republicans will once again fumble away the game. The Republicans sit on their hands and worry only about how to keep “moderates” in office and keep out conservatives. Republicans ignore at their peril, the ferocity of the coming Democrat campaigns for Red State Governorships, Senatorial and Congressional races as well as Secretaries of State and Attorney General’s positions. It is these smaller races where the strength of a party lies for fending off lawsuits against conservative state initiatives and for holding power when redistricting congressional districts comes up every ten years. Democrat PAC’s bombard my email ten to fifteen times every day pleading for donations, even as low as a $1.00, to combat Republicans who are destroying Obama’s legacy, shredding the Constitution and with other outlandish claims that Trumps impeachment is on hand if they only had only a few dollars more. These are followed up with sad pleas that they missed their goal because I didn’t contribute and yet, I read where the Democrats are gathering donations at a rate that far exceeds the GOP’s efforts. I can understand that. I no longer donate to the GOP because they have become a money grubbing organization, not to promote the conservative Republican agenda, that they despise by the way, but to fund the elections of moderate candidates willing to become swamp creatures, or to fund Democrats if a Republican candidate doesn’t signal he/she is one of them. I don’t know about Ed Gillespie except that he falls into the “Moderate Republican” category, gave lip service to Trump but didn’t or wouldn’t embrace Trump’s immigration policy, military buildup policy, and healthcare policy, tax-reform or job creation. Trumps record of success on all of those, except replacing Obamacare, are masterstrokes of managerial efficiency. Reducing the “deep state” is going on apace. The Republicans will be facing a catharsis if they deliver to us any more such losses. The moderate Republicans will always fail because they don’t realize that Donald Trump is a successful business manager, a promoter of what’s great about America and America’s workers, and not simply an ineffective drone of a president that elite politicians can manipulate to affect domestic and foreign policy to satisfy their corrupt ends. Trump will never be a tchotchke. Daily he sets the news agenda for the media. and has them chasing rainbows, creating fake stories just to fill space and directing issues where he wants them. In Virginia’s governor race, with Trump away, the GOP did none of these. The GOP is leaderless, adrift on a sea of inaction. Perhaps they should join Trumps party! WASHINGTON, D.C. – U.S. 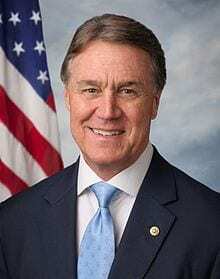 Senator David Perdue (R-GA) spoke on the Senate floor to set the record straight on Democrat’s false assumptions on tax, which have been proven wrong. WASHINGTON, D.C. – U.S. Senator David Perdue (R-GA) spoke with Joe Kernen on CNBC’s Squawk Box about why the budget process is a sham and should be viewed as merely a way to fix our tax code this year.